Among the many cinemas which have existed, and still exist in London, only one was ever known as the Showplace of the Nation and that was the old Empire Cinema, on Leicester Square, an area of Westminster still at the film-going heart of the capital. Films made their début on Leicester Square in March, 1896 when the Lumière Brothers moved the country’s first moving picture show from the Regent Street Polytechnic to what was then the Empire Music Hall. The films shown complemented the live acts on the bill as they did at the Square’s Alhambra Theatre later in the same month and moving pictures continued to be shown in this way until the area’s first real cinema opened – The Bioscopic Tea Rooms – at No 28Ain 1909. Over the next nineteen years or so this venue changed its name to The Circle in the Square and Cupid’s but by the time it closed in the late 1920s, it had become The Palm Court Cinema. The writing was probably on the wall for The Palm Court from the moment Hollywood’s mighty Metro-Goldwyn-Mayer studioopened its luxurious Empire Cinema on the site of the old Empire Music Hall. Nothing like the Empire had ever been seen before, in London, with its seating for over 3000 patrons, its chandeliers, its luxurious fittings and its domed auditorium. By 1929, the all-singing, all-dancing, all-talking hit, The Broadway Melody, played to well over 80,000 in just one week. Other huge successes were Gone With the Wind, in 1940, and the film with which the old Empire closed, in 1960, Ben-Hur. In late 1962, a new, sub-divided Empire emerged, from the old, much as it is today. To the right of the Empire stood the Monseigneur News Theatre where, from 1936, audiences could watch the latest newsreels, documentaries and cartoons. This was constructed out of the lobby of the long-vanished Queen’s Hotel and remained open until 1978 by which time it had become the Jacey specialising in films which attracted the sort of patron who wore a raincoat, whatever the weather! However, to the left of the Empire, and very much in its shadow,was the subterranean Ritz which from 1937 until the early 1980s operated as a separate theatre until it lost its Leicester Square entrance and was subsumed into the Empire complex. After its closure at the Empire, from the summer of 1940 until the summer of 1944, the Ritz was one of the few places in Europe where patrons could see Gone With the Wind. As an underground cinema, audiences probably felt safe there during air raids especially after a landmine fell on the Square in October, 1940. 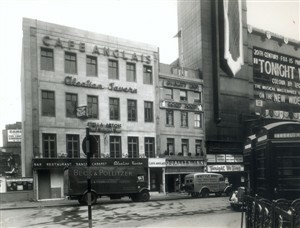 On the south-west side of the square, with its fine 1930 façade partially hidden by advertising hoardings for what is now the Odeon West End, stands what was once the Leicester Square Theatre. Originally planned as a live theatre, it opened as a cinema seating over 1700 in December 1930 and for some years was the showcase for pictures made by R.K.O. Radio Pictures but by the late1930s it had become part of what was later known as the Rank Organisation who renamed it the Odeon West End in 1988. Although physically in Cranbourne Street, the Warner cinema was, as its successor still is, very much associated with Leicester Square movie-going. Opened as Warner Bros’ showcase European cinema in 1938, it was built on the site of Daly’s Theatre which had specialised in musical comedy. Despite this tradition, the Warner did not open with a musical but a huge, spectacular and prestigious Technicolor romp – The Adventures of Robin Hood – starring Errol Flynn in the title role. Inside what is now today’s multi-screened Vue cinema nothing of the old Warner remains but outside its restored and typically 1930s’ façade still offers passers-by a hint of the event that going to the pictures on what was once regarded as glamorous Leicester Square – London’s Celluloid Centre – really meant. This page was added by Adrian Autton on 13/06/2014.